In many parts of the world, Summer's heat can be extreme. Being a species that adapts easily to the environment, we find many ways to deal with this bit of unpleasantness. One global method of dealing with heat is with sipping a cool or chilled beverage. I have several favorite coolers I like to make at home. I've shared a few of their recipes below. Take note of the many amazon items I've included as well. They can increase the enjoyment of your cold drinks. There are tips below and other tidbits of information. Use this handy link to convert any volume or dry-goods measurements. I only use Luzianne in my iced tea, unless I dress up the flavor with mint or green teas. Luzianne blend for iced tea doesn't go bitter no matter how long I steep. When do you prefer iced tea? Do you drink iced tea year round, only in summer or some other time of year? I don't drink iced tea at all. I drink iced tea only in summer. I drink iced tea only in winter. I drink iced tea only in spring. I drink iced tea only in fall. I drink iced tea the year round. I fell in love with iced tea when I was stationed in South Carolina. It seemed that no matter where I went, the tea was perfect. Must be a Southern thing. Moving to another state, sweet tea was a bit harder to come by in public eateries. I also discovered just how difficult it was to make perfect iced tea when trying to do so myself. I suspect folks down South learn the trick to it in preschool or something. It was years after I moved here before presweetened tea was available in restaurants and fast-food places, though it had been a menu option in any restaurant I'd gone to in South Carolina. Even if it's available now in local restaurants, it's usually bitter, syrupy or otherwise not very good. I finally decided I had to learn to make iced tea to suit my palate or go without. Luzianne iced-tea blend family size bags is what I always start with. I like just a hint of sweet in my tea. This recipe only uses a quarter cup of sugar for a two-quart pitcher of this lovely brown elixir. Add more if you need it. Since Luzianne produces a wonderfully smooth tea, I don't need a great deal of sugar. I also find when I get distracted and leave it steeping for more than a few minutes, say a few hours, the tea is as smooth as a five-minute steep would produce, just quite a bit stronger. Sometimes, and rarely at that, I add a mint tea bag or a green tea bag also in the steeping process. This adds a hint of je ne sais quoi. I normally use a pan to boil water, but for the purposes of this lens, I've used an electric teapot. The instructions take into consideration that not everyone has an electric teapot. 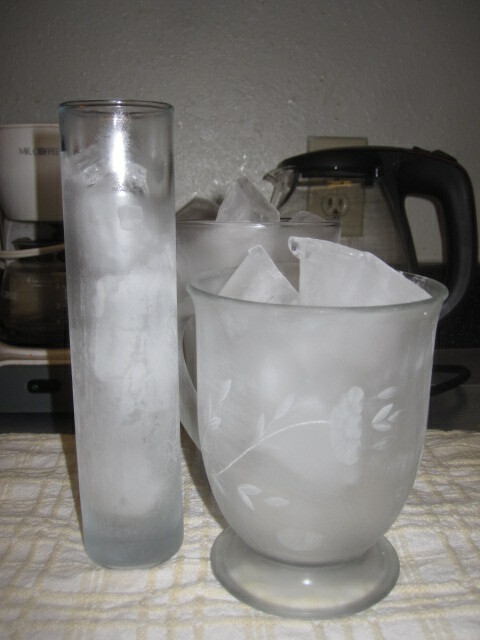 Though I refrigerate my iced tea first then serve it over ice, you can serve it over ice as soon as it's done. A lemon wedge is always a pretty embellishment on the rim of a glass of Iced tea. The beauty of plain ol' iced tea is it's so good while being so simple. Iced tea has a history. Doesn't everything? Take a moment to visit this link to learn of the distinguished origins of this venerable beverage. 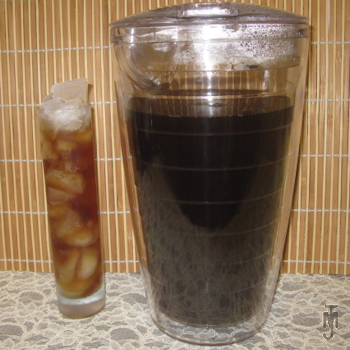 I've also created a complimentary hub to this iced beverages hub, Hot Beverages. 1/4 C sugar (more if desired); white, brown, raw, or other sweeteners as desired. Put tea bags in pan, draping them over the side and reseating the lid. Allow to steep to desired strength. Stir in sugar after steeping complete. Fill with cool or cold water to make two (2) quarts. Not only do I use flower waters in baking, I use it in beverages for that touch of "Je ne sais quoi." Flower waters add that something special to any cup of tea, hot or cold. Peach tea is a favorite of mine. I refrain from ordering it in restaurants as it's usually too sweet. 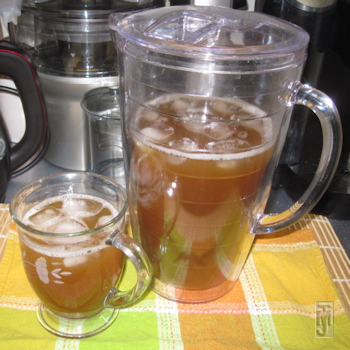 This recipe for Peach Tea produces a tasty and refreshing beverage. Though I've provided the straightforward method I use when making peach tea for anticipated guests, I do have a few variations I use for myself and special friends. In this recipe I used Bigelow green tea. Stash's green tea is another favorite of mine. I also used Ahmad Ceylon Tea (1/4 cup loose tea) instead of the Luzianne tea. When I restock on the Ahmad tea, I have a special treatment for it. Dump the tea in a large bowl. Pour rose flower- or orange flower* water over the tea as you keep stirring. You don't want to use enough to leave a puddle in the bottom but you do want to thoroughly wet the entire measure of tea. Line a cookie pan with foil then parchment paper. Spread the now moistened tea in a thin layer over the parchment paper. Dry in a warm oven (lowest setting on your oven) until it is no longer damp. *Note: I've provided a link to the brand I use at home. There are other brands on the market for rose and orange blossom waters. JR Mushrooms and Specialties on Amazon also produces both types of scented/flavored water. When I make my teas using the doctored Ceylon tea, there's a wonderful fragrance which frames every sip. I prefer to chill the peach tea once it's complete then serve it over ice when guests arrive or when I have a hankering for iced tea myself. Every time I make it, I swear it's too sweet and next time I'll use an eighth of a cup of sugar instead. Every time I make it though, I use a quarter cup still. Hmmm. It doesn't matter what brand of peach tea you use. I like Jumex because it's not overly sweet in spite of the fact that the sugar and/or high fructose sweetener is number three on the ingredients listed on the can. Peaches and green tea are both natural sources of antioxidants. You can also play with the balance of the tea and peach flavors. If you want more green tea flavor, add another bag of green tea and use two regular size bags of the Luzianne tea. Be sure to purchase a box of regular tea bags rather than family size tea bags. Add half a can or so more of the peach tea, if you prefer a more peachy taste. Since many of my links are to online sources for grocery items, I thought I'd note that I hope to be able to do more of it in the future. A good friend of mine does all or most of her grocery shopping online. For me, a single person with a full-time job, that's hard to do because I don't buy or use the quantities that would make it worthwhile. However, it would make my routine a bit easier to manage if I had more coming in by mail rather than taking the time to visit various shops. Stash brand teas have been a favorite of mine for some time now. Green tea comes in so many varieties these days. You can't go wrong with Bigelow. There's nothing like the taste of a steaming cup of chai tea in front of the fire with a good book in front of one's nose. Even better is when it's iced in the summer and you're sitting in a cafe planning your shopping itinerary with a good friend. It's served light brown and creamy, not to mention smelling just simply delicious. The combination of spices are what gives this delectable beverage its distinctive taste. Quality spices are necessary to ensure the best possible taste. I use Penzey's spices. Their reputation for quality underscores their long history. You can also request a copy of the their catalog or download one. Wikipedia has a brief article on Penzey's history. We find the origins of chai tea, rather masala chai, in South Asia. Wikipedia provides excellent information as to it's origins. 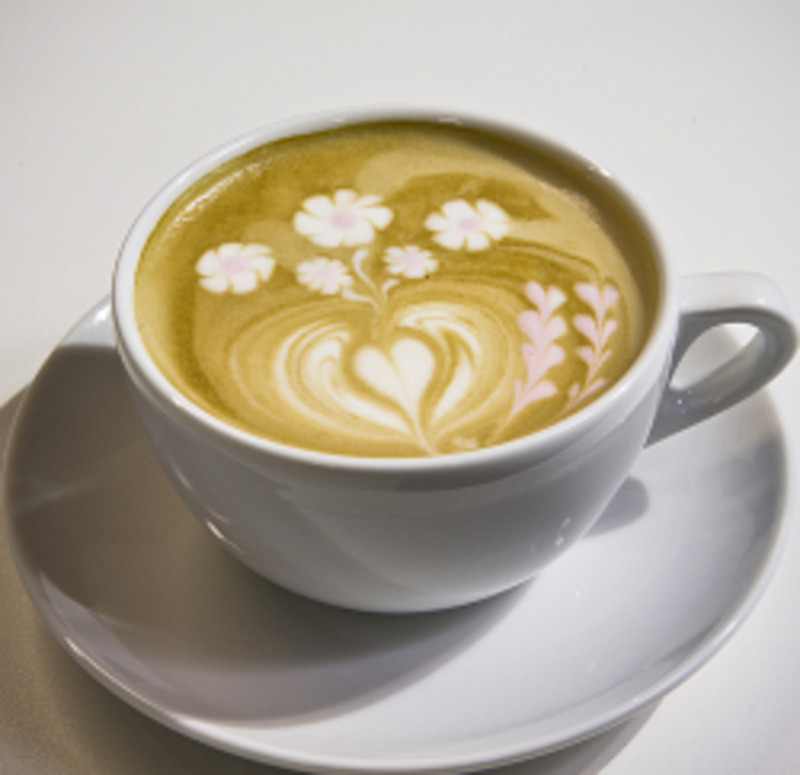 It's popularity has spread world wide and is found on the menu of many cafes. Though the tea recipe I provide here is similar to traditional chai spiced tea recipes, I have a few preferences which are my own. 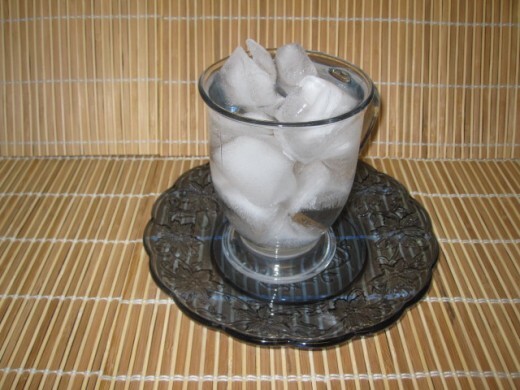 One, is in hot weather, I prefer clear tea on ice. So the recipe I present orders the steps so that you can make it my way or proceed on to make it with milk or half and half. That's why the tea here is pictured as a dark brown beverage rather than a creamy brown one. Feel free to fiddle with the ingredients to suit your palate. Star anise can dominate with only one star, so feel free to use the larger suggested portions. I like a more candy-like taste which is provided by the stronger taste of anise. I don't sweeten over much, thus you may want to use more than just a quarter cup of sugar. Pour tea into pitcher then add additional water to fill completely. If using milk or half and half, before removing from heat, strain spices then stir in milk and half and half and bring back to a roiling boil. This can be served hot or chilled over ice. A friend gifted me with one of these when I'd had surgery. I love it. I had a limit to the amount I could lift for a few weeks after surgery and this was the perfect answer. I didn't have to worry about trying to manage a pan full of hot water. I also make tea directly in the pot as well. It makes enough for a 2L pitcher of tea with a little added water. Dissolve 2 cups of sugar in 2 1/2 cups of water (or 1 cup of honey). When it comes to a boil, add 1 cup white vinegar. Simmer 1/2 hour. Add a handful of mint, remove from fire, let cool. Dilute the resulting syrup to taste with ice water (5 to 10 parts water to 1 part syrup). You can store the syrup without refrigeration. In a heavy bottom pot combine sugar and water, place on medium heat and stir till sugar is dissolved. Reduce heat and gently boil for 10-15 minutes. Add 1/2 cup of vinegar and simmer for 25-30 minutes or until it thickens. Taste and adjust the level of sweetness or sourness of the syrup. (I usually add an additional 2 tablespoons of vinegar since I like it a bit more sour). In the last minute or two add a small bunch of fresh mint to the syrup. Remove from heat and let cool completely. Remove the mint leaves. Best Whiskey Stones Gift Set with Magnetic Closure - Unique Present Box - Soapstone Chilling Rocks and Velvet Bag to Cool Bourbon with No Ice - 9 Reusable Cubes - Are Your Dad, Husband, Scotch Lovers? Not only great for whiskey, for those of you who imbibe, but also great for keeping other drinks cold. This is one of my favorite treats to make. I have always enjoyed the classic 50-50 bar. Creamsicle is another name for this ice-cream-on-a-stick delight. 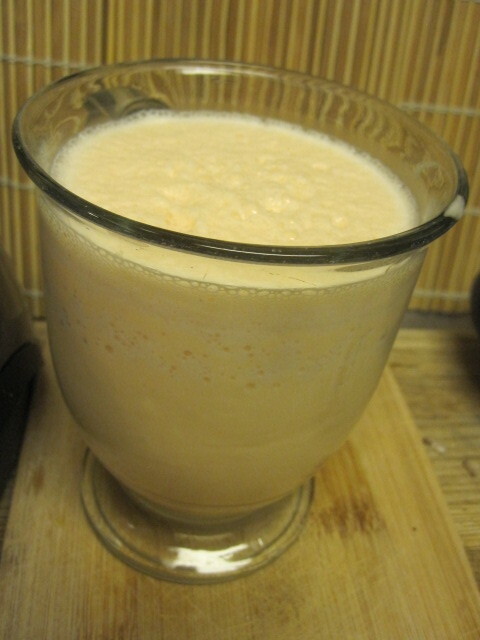 In my own adaptation of that taste of frozen ambrosia, I make a shake from a few simple ingredients. It's delish. Scoop your ice cream into a blender. Start with half a bottle of soda. Blend on the cream setting then switch to liquefy. Use the latter setting for the lesser amount of time. Add more orange soda or ice cream as needed to reach your desired thickness. Pour into a glass and enjoy. I use raw sugar. If I'm going for sugar free, I use Truvia or Wholesome Sweeteners Organic Stevia. The word frappuccino, is a familiar member of most people's vocabulary. 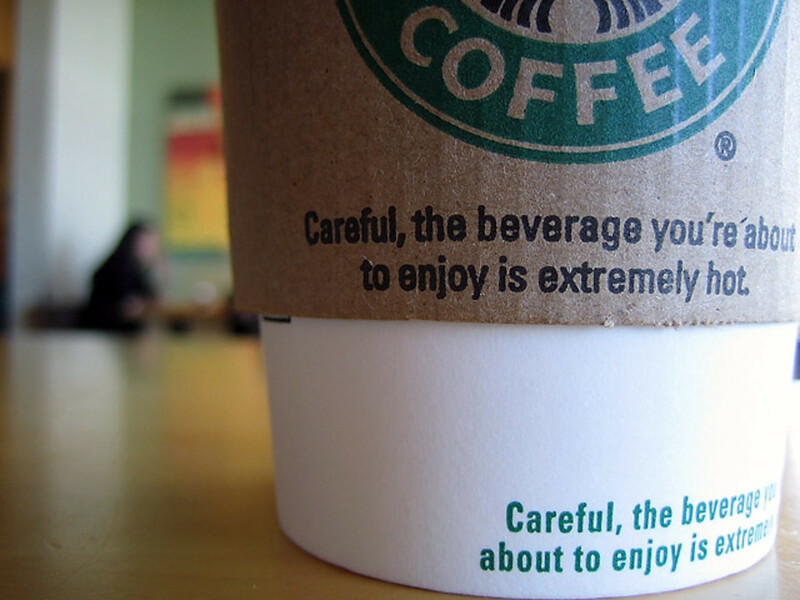 It was made popular by the Starbucks chain of coffee shops. Wiki provides a more extensive history of the Frappuccino. When I make mine I use Breyer's No Sugar Added Vanilla Ice Cream. I try to reduce the sugar content to the best of my ability. Add all of your ingredients to the blender* except the ice cream and ice. Mix until the chocolate is blended in. Add the ice cream and blend until creamy. Add the ice. Blend until there are no more large chunks of ice. Pour into a frosted glass and serve. *Ensure your blender can also crush ice. This is a very simple drink to make. It's also very flexible. 1 cup or more of apple juice or other non-citrus juice. 1-3 cups of semi frozen fruit, e.g., berries, pineapple, and or mango. The fruit is semi frozen so that ice isn't needed. Add juice and orange wedges to blender using the liquefy setting until only small bits remain. Add frozen fruit and set to mix or ice crush until slushy. Add milk and honey and banana. Blend until thick and frothy. Feel free to play with the ingredients to achieve your desired results. The sweet pleasures of a spring cocktail without the alcohol. Delicious basic and flavored iced tea recipes. Enjoyment of food, has to start with the enjoyment and admiration for basic ingredients and the artistry of the cook. The same holds true for the drinks, whether soft or otherwise. Mixology has become a prominent theme in the restaurant world, and a. A jaggery and pepper drink flavored with cardamom is both cooling and refreshing on a hot summer day. My hibiscus herbal iced tea bursts with flavor and is perfect for a hot summer day. It is also bursting with nutrients. One of the most refreshing drinks I can think of, lemonade is a favorite worldwide. One thing I like to do with lemonade is to add mint to it. It's rather simple. Start with my lemonade recipe, chilled, (make it sweet to the point of syrupy), then follow the instructions below. In a blender, add 5 - 10 mint leaves with ice cubes. Blend on the crush setting for ice. Be sure your blender is intended for crushing ice. Fill each glass with crushed ice (heaping is best). Pour lemonade over the ice. The alternative icing options to the right are interesting and some are even amusing. I don't consume alcohol, but the idea of icing a glass is closely associated with the bar-tending trade. I do enjoy sipping my iced tea in an ice-frosted beverage glass, however. So, no, don't rush out and have a bar built so you can practice this technique. Select the glasses you wish to ice-frost. In many images I use for beverage recipes, I use a tall narrow bud vase to serve beverages. For the sake of the image, I use clear glasses. Rinse the glasses and shake out any excess water. Fill the glasses with ice cubes or crushed ice. For this purpose, I crush Ice by wrapping the cubes in a tea towel or kitchen towel then use the handle side of a table knife to crush the ice by tapping it hard with the flat side of the knife. Set the glasses in the freezer until you're ready to serve your beverages. To serve, pour the cold - refrigerator cold - beverage into the iced glasses then serve. The glasses frost over once they are removed from the freezer. 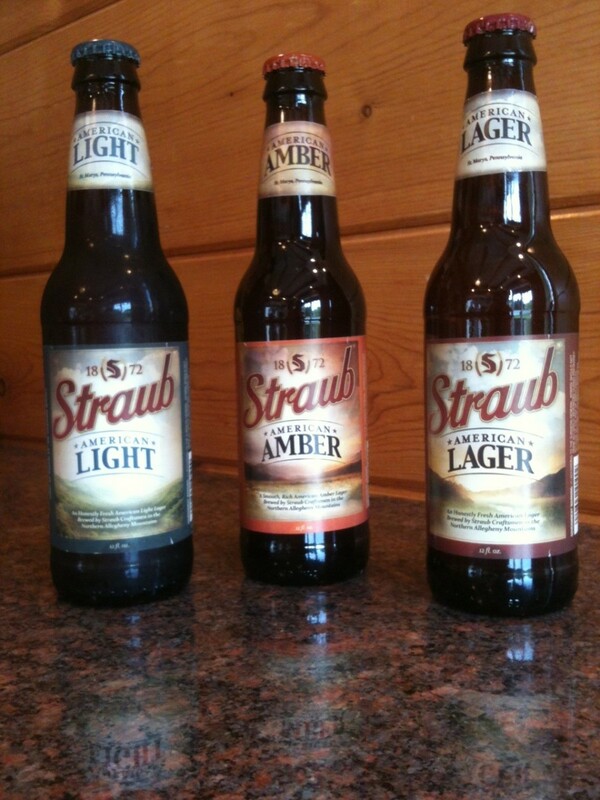 Very cold beverages prolong the frosted look. Thanks for taking a moment to stop in. I appreciate your comments. This is a very useful hub, Arachnea. The 50-50 shake sounds absolutely delicious! Thanks for sharing all the recipes. They certainly sound refreshing. Jodah, thanks for stopping in and commenting. I always enjoy hearing from you. You have such kind things to say. I suspect Texas and Australia have extremely "warm" summers in common. This is great Arachnea. Cold drinks are always top of my agenda as the Summers get so hot here in Australia. I have never tried an ice tea that I really enjoyed but it sounds like it is made perfectly in South Carolina. I have never come across a restaurant here that makes it (you have to buy pre-bottled). The Frappacino and the 50-50 Shake sound great to me, as does the minted lemonade. Some great recipes and tips here in this wonderful hub. Voted up.